We work directly with home owners, insurance companies, and stratas across the lower mainland. 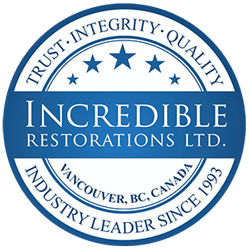 It can be challenging to estimate a price on an emergency bill, however, in the event of water damage in your property you can call Incredible Restorations and we can assist you the best we can. To get more accurate pricing on an emergency bill, you can send us photos and describe in detail the extend of the damage, and we can provide you with a rough range of the cost. Each inspections includes a detail list of all components required for a complete restoration of the property. Additional costs of upgraded quality materials and inherent complications with the job at hand.